Get ready to fulfill your potential as you learn top commercial production and writing skills – on our Songwriting & Production Academy Program, that’s fully supported by such platforms as Ableton, Apple and Native Instruments. Our students learn the knowledge and skills to be able to stand out from the crowd in their chosen genre, all the while getting the very best tuition from our superior roster of music production instructors. Our courses allow you to work in-studio and also on projects outside of the classroom. Our strategically-timed mentoring sessions ensure that students will be able write, produce, mix, master, engineer and promote and release their very own EP. Further, they’ll be able to book our professional, acoustically-treated mixing and mastering facility. Garnish offers the Music Grades System for music production, and was the first music production school in the world to offer this opportunity. All Academy learners worldwide get to take a Grade 6, 7, or 8 exam. You can find out more about music production grades by clicking on our London website here. Even if these UK music production qualifications aren’t pertinent to your goals, be assured that our program does meet a national standard of accreditation. Garnish is an Ableton-Certified Training Center, which means our students qualify for a 40% discount. Ableton’s responsiveness and flexibility has made it a favorite DAW amongst top-level songwriters – it’s renowned for making the art of melody creation fun, creative and inspiring. Having fun is the best environment in which to learn – which is why Ableton is so favored by songwriters as THE tool for getting ideas together. 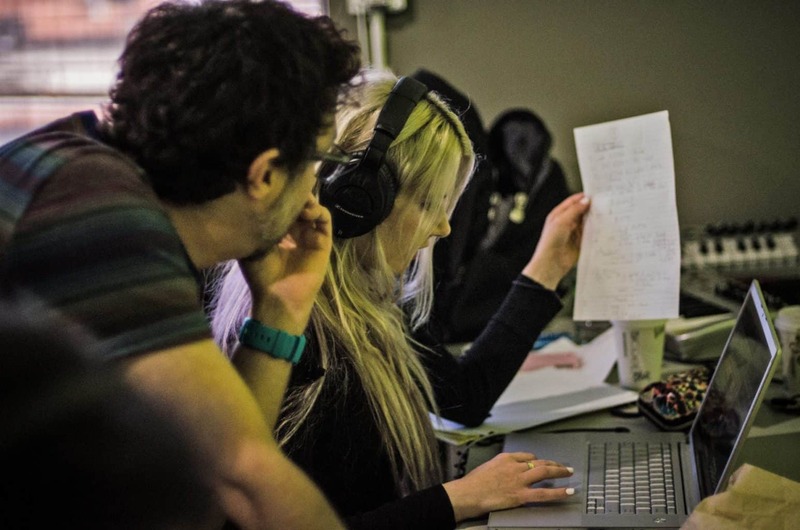 Our instructors boast a wealth of contemporary record production skills, techniques, tips and knowledge that they skilfully impart to their students to help them create original tracks. Under this tutelage, students will build their own commercial backing track (be it in pop, urban, rock, singer/songwriter or commercial dance genres) that’s match-fit for A&R departments and production music houses. This part of the program places emphasis on programming bass and strings parts, sculpting organic sounds, synthesis, song arrangement, appropriate sound selection for their production style, and, importantly, bringing all of these elements together into a coherent whole that ensures the production is ready for the mixing stage. This module truly gets to grips with all aspects Logic Pro X, ensuring that students have a thorough command of it upon completion of the program. They will become familiar with such features as Flexpitch, MIDI FX, how to slice loops to use with EXS24 and will also learn all about the wonderful built-in sounds and FX that come supplied with this comprehensive digital audio workstation. Logic Pro X is favored by many top contemporary producers for its “sound”, and they also contend that it’s easier to finish tracks in Logic than other DAWs. There is also the dimension that the different interface is simply preferable to certain users, and so we offer both. If desired, upon passing their exams, our students become an Apple Certified Pro in Logic Pro X. We are able to put our students through the relevant official training to make this happen! Please note that this is an optional extra that we are happy to offer at no extra cost – and it can be taken outside of curriculum hours so there’s no disruption for those who don’t wish to pursue this qualification. Students simply choose when they want to take it from our production course schedule. It can be taken during or after Academy program. This module deals with the incredible world of subtractive synthesis and sound design that’s built in to your DAW, and hardware in our own generously-equipped lab. Learners will encounter oscillators, filters, ADSR and FX and then learn how to create, craft and manipulate their wildest imaginings into sounds for use in their own productions. It also covers how to make sample packs. This module teaches students how to master the art of capturing various typical instruments like bass, piano, guitar and synths. An integral part of any production, this skill set also specifically covers vocal production – and with the songwriter and producer in mind, rather than just the singer. Encouraging, coaching, and producing artists and session vocalists will always help them commit to their best work, and the more you can learn about how to achieve this, the better. The lead vocal is the lifeblood of songs and needs to communicate and shine to show the song off to its best effect. Even if you have no aspiration to sing yourself, knowledge of vocal production and singing technique is invaluable! We begin, unsurprisingly, at the beginning – by discussing acoustics and the attributes of the home studio – then move on to the bread-and-butter of mixing: this means in-depth EQ, dynamic controllers, filling the frequency spectrum, generating a huge sound from just a few elements, mixing vocals and bringing a production’s disparate parts together to create a finished sound. During the course of all of this, students will get to explore all of the amazing plugins used by our mix engineer/instructor. We lift the lid on the mystery that is the role of the music producer! This module brings together all of the skills and techniques from previous modules, so that the journey from idea to pre-production to completion and delivery of the finished master gets a thorough exploration and analysis. The sum of the parts should always be greater than the worth of the individual parts themselves, and here we use all that we’ve learned – by exploring conceptual points like the creation of emotion through sound and performance, production goal-setting and defining a recording’s direction. This is the ‘rock-face’ of music production, where creativity and discipline meet to help students bring to bear what they have learned in order to make the music they have always dreamed of making. By conceptualizing the essentials of both the material and its “sonic field”, students can learn how to make the artist unique and compelling – which must always serve the material and its performance in the best possible light. Students will get the opportunity for some hands-on training in our very own commercial recoding studio here at Velvet Basement. Further, there is also a pre-production studio field trip, which offers students the chance to get creative in a room that’s chock-full of some amazing vintage analog synths and processors – time to find some awesome analog sounds for their own productions! In a finishing touch to the program, students learn how to create an EPK (Electronic Press Kit), an essential part of how to market and brand themselves. They will also examine techniques to acquire genuinely interested social media followers, and how to get the best out of digital distribution opportunities.